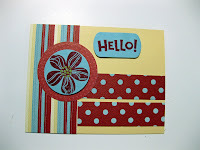 What a fun, bright card! It's nice to see the cheery colors after such a dreery month here in Colorado :O) Hope your day is grand! What a bright and fun card! I LOVE it!!!! I love that textured patterned paper. It's not cheating to use it on Tues night that's smart planning! I love the bright cheery colors! It's awesome! Love your card Harriet! The bright colors are beautiful! I've had such fun being a Sketch Girl with you all! Love these colors and great job on the sketch!!! Too cute, love the bright polka dots!